Potential reviewer must be nominated by the established scientists (or advisory board members) in the corresponding fields. Nominated reviewers must be approved by the editor of the Journal. Potential reviewers should be very good at the corresponding areas or fields. S/he should have a profound understanding of materials for reviewing, and s/he must be actively involved in research/teaching within the past two (2) years when nominated. S/he must be familiar with current development of respective scientific fields. A reference letter from independent personnel with plausible credentials, including but not limited to: tenured professors of university in United States; scientists from Research and Development departments of industry research; research personnel from government agencies and laboratories; and other accredited institutions of such nature. Final decision of selection is the responsibility of Editor-in-Chief for the journal. Criteria provided in this guideline only serves as minimal requirement for the selection of a reviewer. 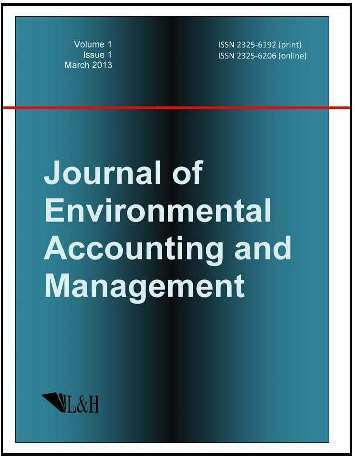 Editor-in-Chief for Journal of Environmental Accounting and Management should consider other facts regarding its particular field and nominated reviewer in deciding whether to accept the nomination or not.